This is my record of the week. Before I write a review of a record I like to scan what's out there already so I don't repeat what has already been said to death. 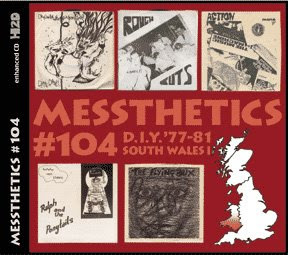 Then I came across this EPIC REVIEW of the record and thought there was no way I could possibly come close to giving this genius collection of obscure punk from Wales nearly as much love. Just when I think I have a slight knowledge of underground weirdo post punk - a record like this comes out and makes me realize how little I actually know. My only complaint about the record is as detailed and full of facts the booklet is - all 22 pages - it doesn't read in track listing order so you have to flip around if you are listening to the disc and trying to match the liner notes to each new song. Not a big deal but a flaw to me none the less. You can hear a few tracks here as well as read another review of the comp. Go to Hyped 2 Death to purchase this comp and many others (link below). I personally recommend the Hyped2death compilation series of obscure old school punk rock from all over the world.